As our whole waterfront staff is gathered at camp training and getting ready for all of you, we are showing off our new Point O’Pines waterfront. 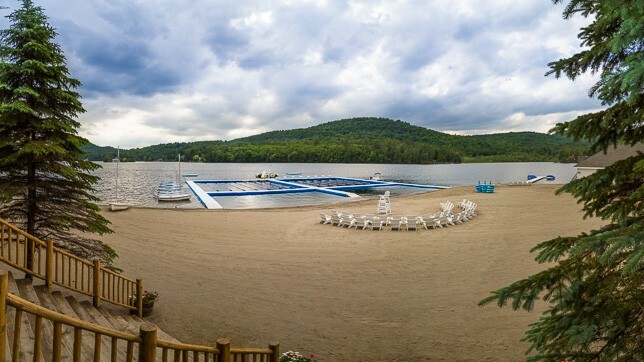 Many new dock sections have been assembled into two large shallow water areas for learning and fun, as well as two full high school or college pool size (called “SCY”) swim areas. Both competitive swim areas have eight lanes each, all with new lane lines, as well as new numbered regulation starting platforms. Out past the swim lanes, we have our ample deep water swim area with the water trampoline and two floating docks. We are so excited for all of you to get to camp and enjoy all that the waterfront has to offer. We have been working for months getting the waterfront put together for you, from engineering drawings to the nuts and bolts. We filmed part of the process over the last week or two and wanted to share it with you. Make sure you thank our great maintenance staff when you get to camp!